Loisaba Lodge has seven rooms, 4 doubles and 3 twins. The Cottage at Loisaba has two large ensuite bedrooms, 1 double and 1 twin, both with ensuite bathrooms and surrounding a duplex sitting room, bar dining room and swimming pool. The luxuriuous lodge also offers two sets of 'Starbeds'. Loisaba Lodge is a remote destinations accessible by Air Kenya departing Wilson Airport Nairobi to Nanyuki and then a 25 minute private charter from Nanyuki to Loisaba's all weather private air strip. Alternatively a 60 minute private charter direct from Nairobi. By road Loisaba is spectacular 2.5 hour drive from Nanyuki. 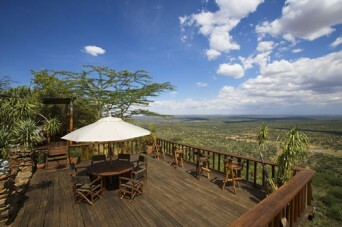 Loisaba Lodge is a luxurious eco-lodge set in the stunning Laikipia region, just 70km north of Mount Kenya. This 150 sq km private wildlife conservancy lies in the heart of the Ewaso eco-system and the Laikipiak Masai community, offering a unique insight into the cultures and traditions of the Masai way of life. Built entirely of local materials including stone, timber and thatch, the ultra luxurious Loisaba Lodge is set high on the edge of the plateau with breathtaking views south, toward Mount Kenya. The seven ensuites rooms all feature large French windows which unfold to a private deck built into the escarpment. All the furniture in the luxurious stone cottages is handmade and the lodge also offers a luxurious swimming pool, tennis court, bocce court and croquet lawn. Loisaba has two ‘starbed’ sites where guests have the opportunity to sleep under the stars on wooden platforms raised up into A frame units. This provides an unforgettable night out fully hosted by the local Masai. Guests can also choose to stay in Loisaba Cottage, a fully exclusive, self contained house built on the edge of the escarpment. The house has its own staff, game-drive vehicle and a private, cliff-top swimming pool. The ultimate hideaway, for small groups. The luxurious Loisaba eco-lodge is best known for its wide range of activities which offer guests the experience of walking and riding on camel and horseback and seeking out wildlife in open Landrovers by day and night. Loisaba Lodge features a swimming pool, tennis and bocce court, croquet lawn and health spa which offers massage and beauty treatment and a romantic open-air bubble bath, all with a tranquil view of the unspoilt Karissia Hills. The luxurious Lodge.also offers a multitude of activities including private day and night game drives in open Landrovers, camel and horseback riding, chopper rides over the northern Kenyan deserts, heli-camping and heli-fishing, water rafting,bird watching, mountain bike riding and Masai guided walking tours. The Lodge also offers mouthwatering multi-course meals and cocktails.